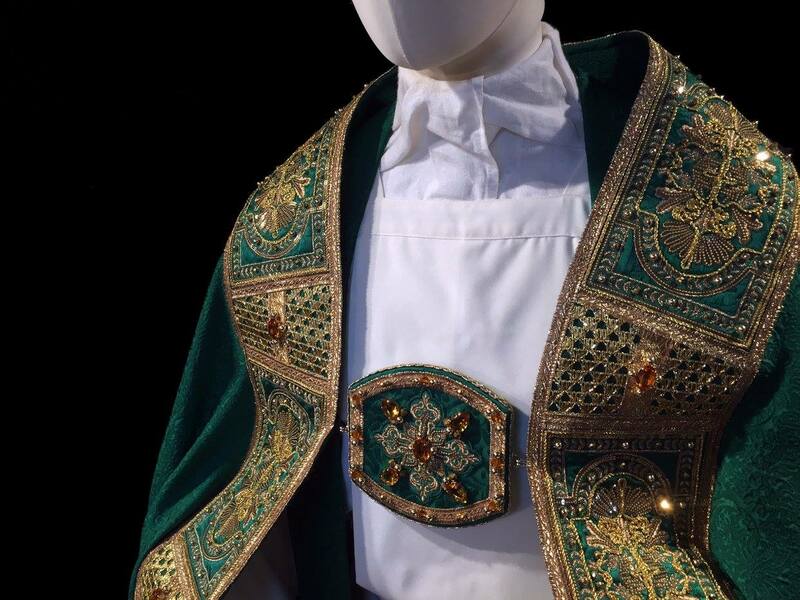 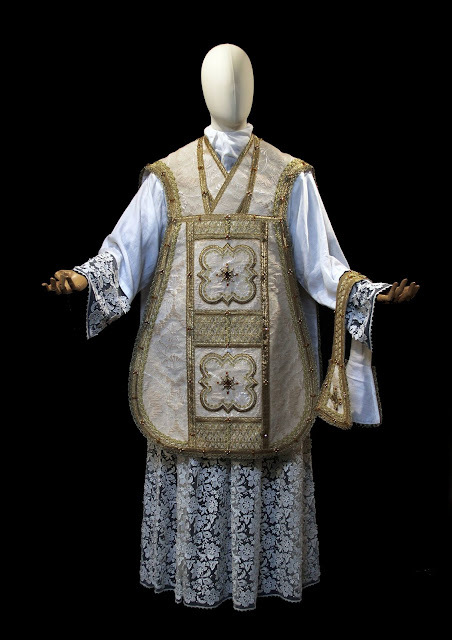 Yesterday I showed some of the precious mitres done by Atelier LAVS and today I wished to conclude by showcasing some of their other vestment work. 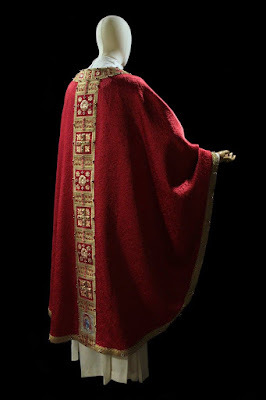 As already noted, this particular firm places special emphasis on medieval models for their vestments and in looking at their site and designs, one can discern that in many instances they are likely utilizing medieval art to inspire some of their designs. 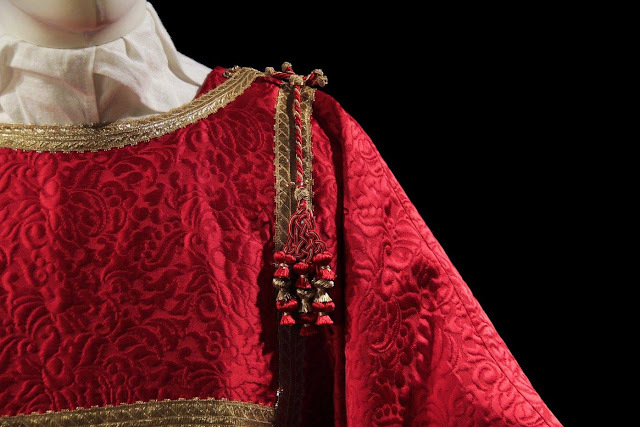 As also noted however, they have not shunned the baroque tradition, and in fact bring their own particular stylistic hallmarks to it. 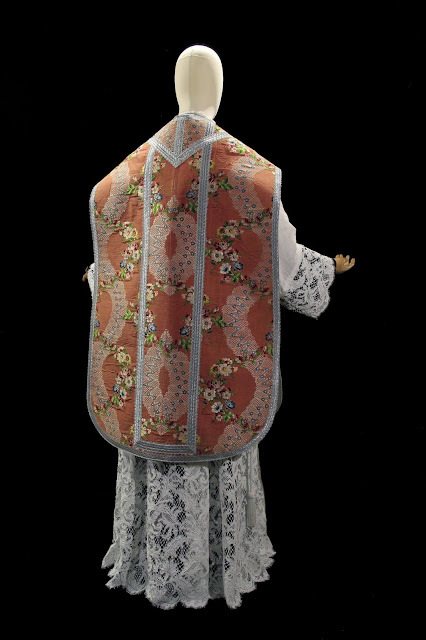 Let's begin with the baroque models and a rose chasuble. 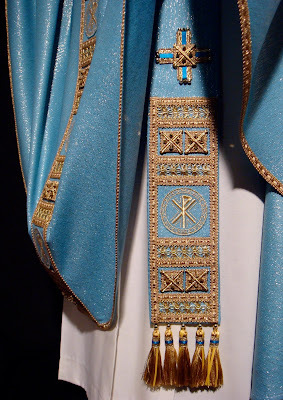 Silver trims often work very well for rose chasubles of this sort of colour profile. 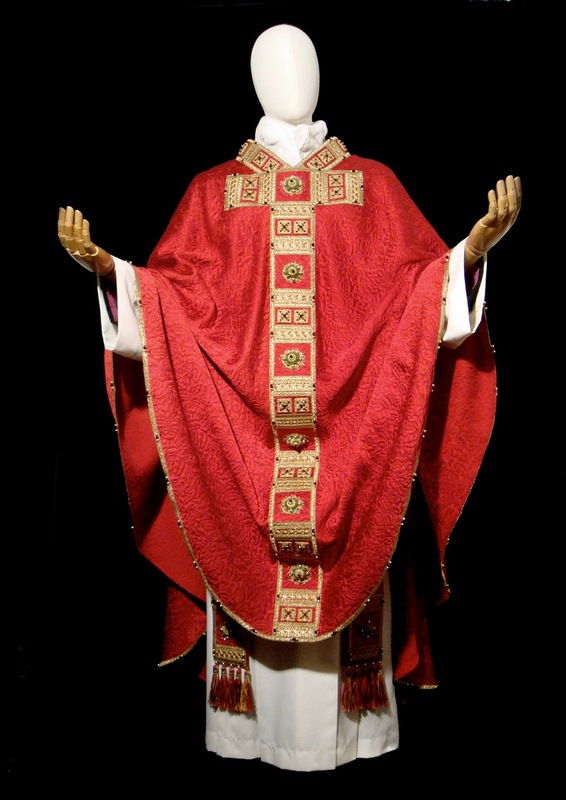 This is a particularly nice shade of rosacea, being neither easily confused with violet or red, but also tending away from a more "infantile" sort of pinks -- what some refer to as "bubblegum" pink. The repeating pattern of the textile is classically baroque. 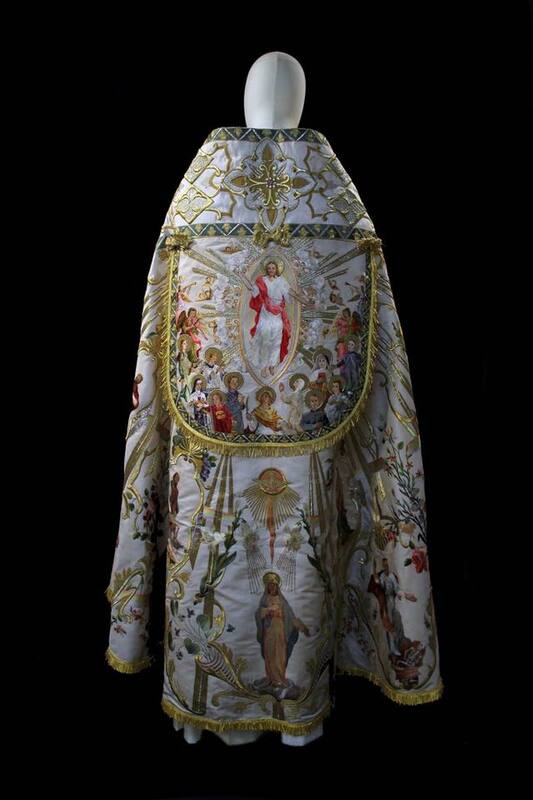 The cut of this looks quite fine. Sometimes too much of the shoulder is exposed in vestments of this cut. 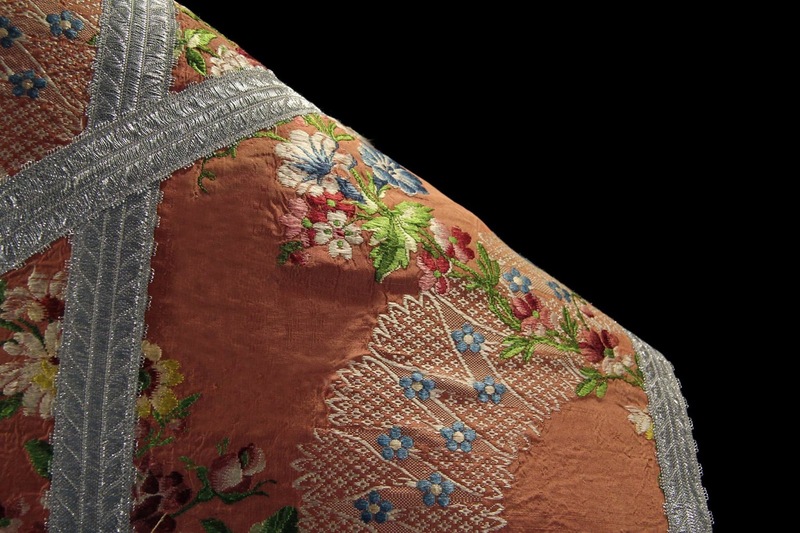 A detail of the floral ornamentation, trims and repeating pattern design. Next two white and a green chasuble, all seen from the front. 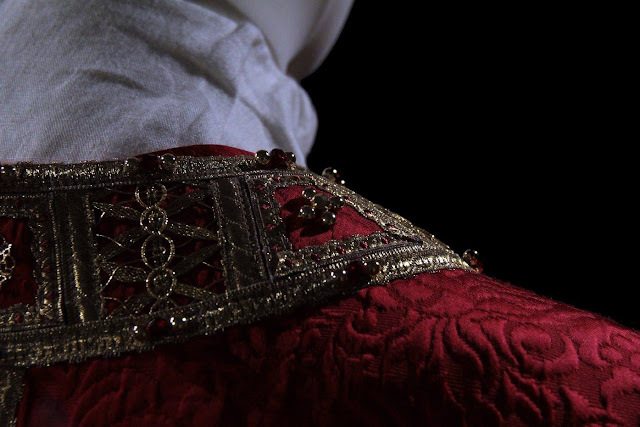 I quite like the textures in these. 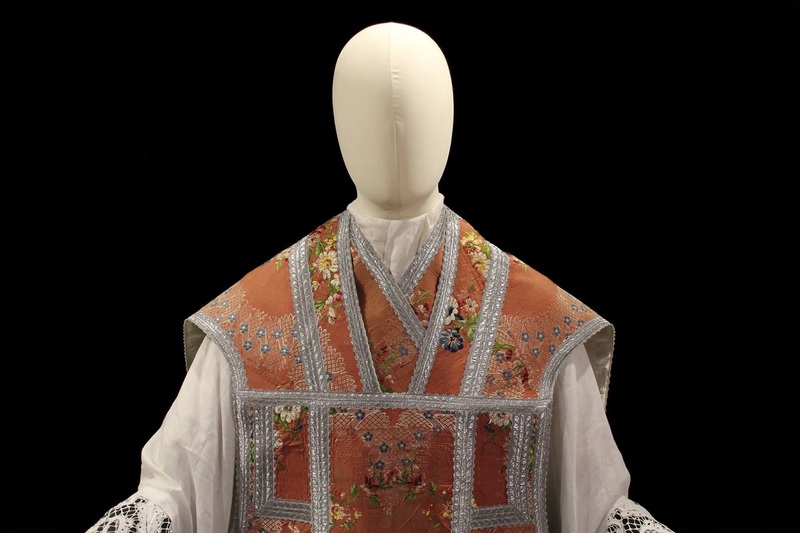 I think you will agree as well that these have a very unique feel to them -- and yet also very familiar because they are rooted in the tradition. 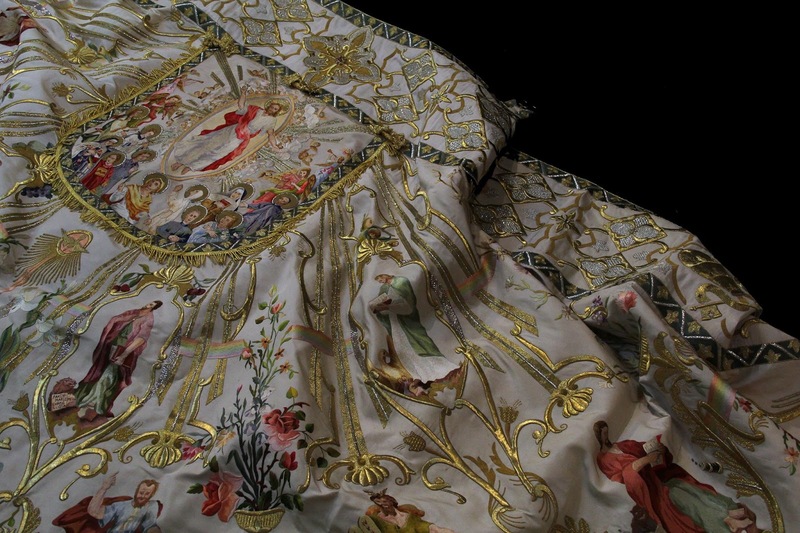 Finally we have a cope in a baroque inspired style. 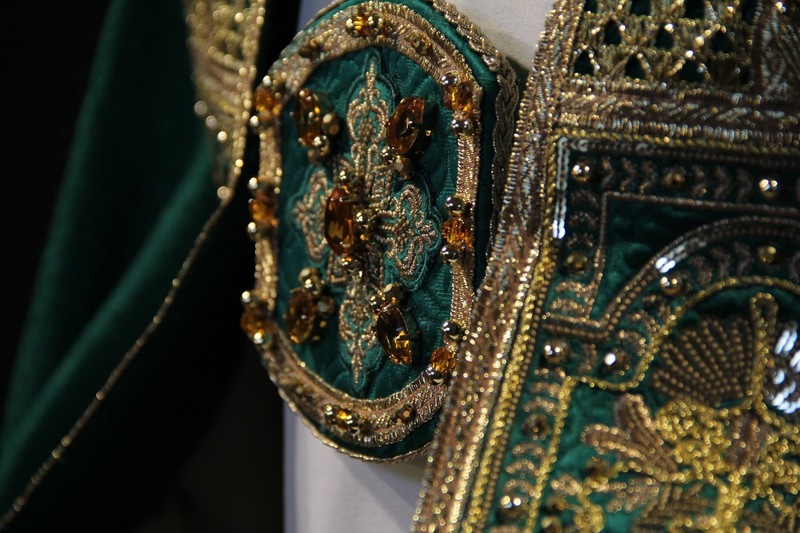 From what I can see, all of the designs you see here are embroidered. Now let us turn our attention to the medieval styles. 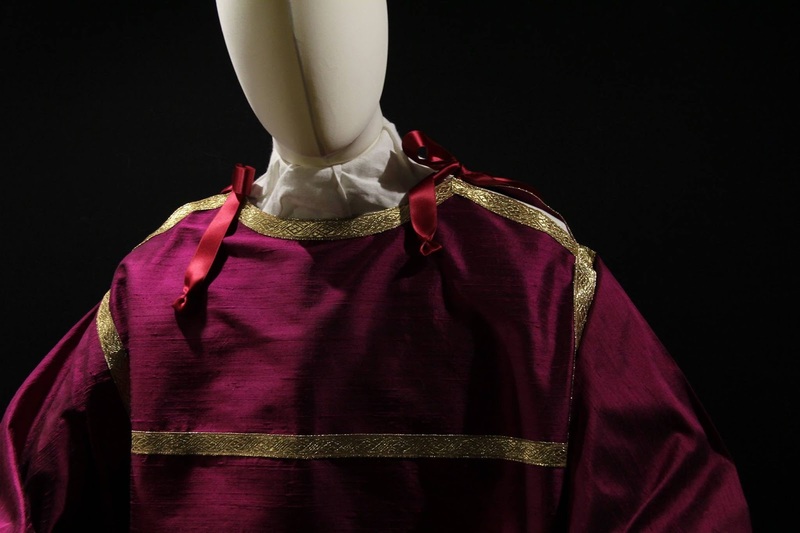 In the first instance we have a pontifical set. 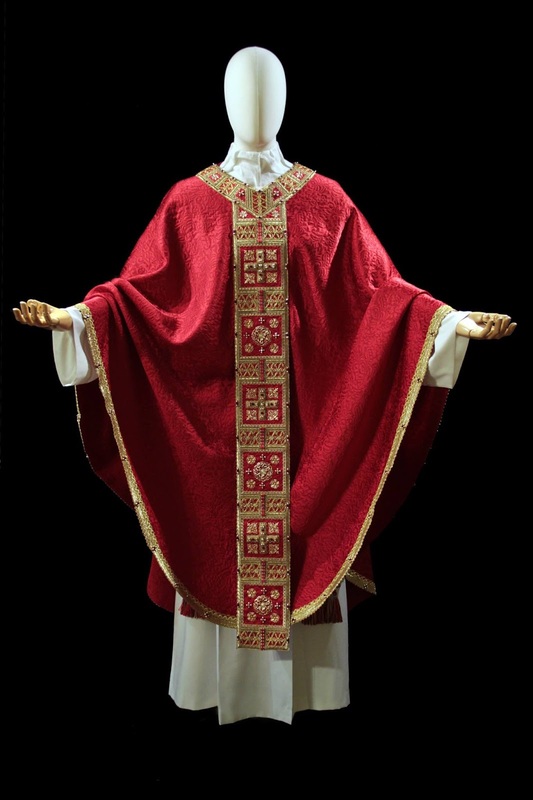 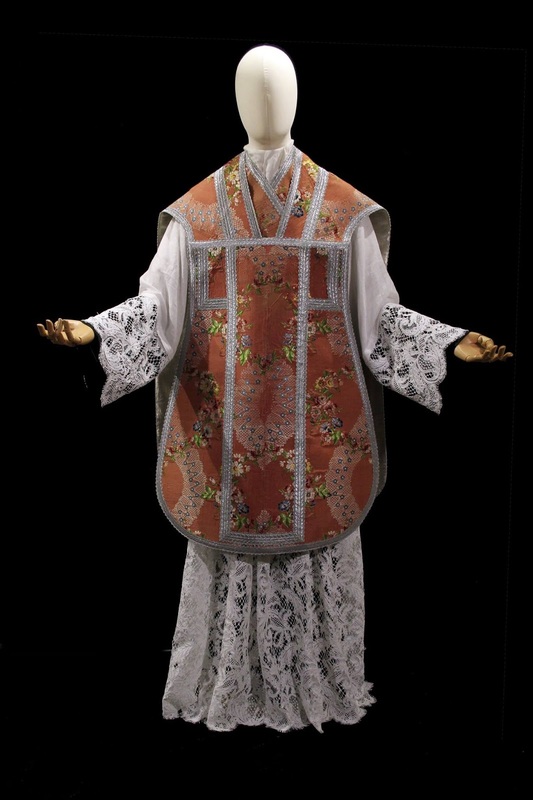 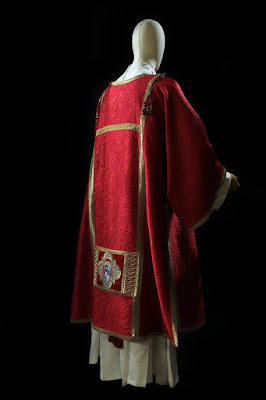 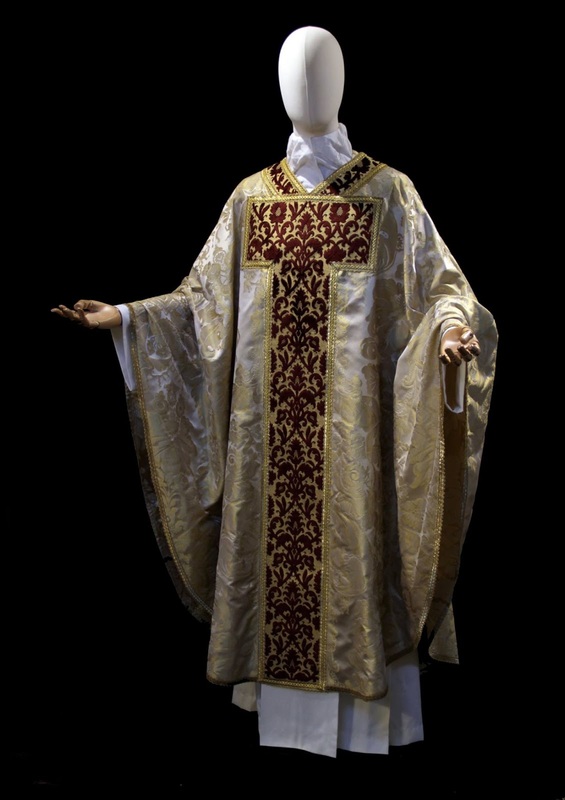 Shown here is a matching chasuble and dalmatic -- and you will note the cardinal's stemma on the base of both. The use of trim along the edge of a chasuble always helps to complete it in my estimation. 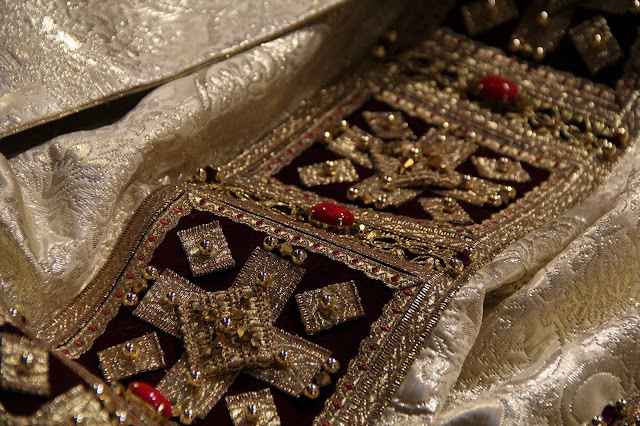 It is a design element that is frequently neglected in gothic chasubles but shouldn't be. 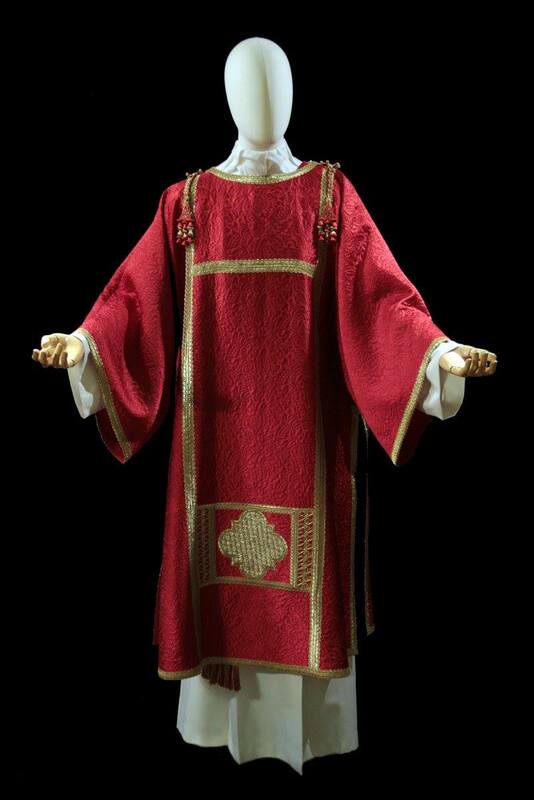 This was something also frequently utilized by Pugin and the early gothic revival. Next is a black chasuble that caught my attention. There's a particularly monastic and Romanesque quality to this particular one I think. 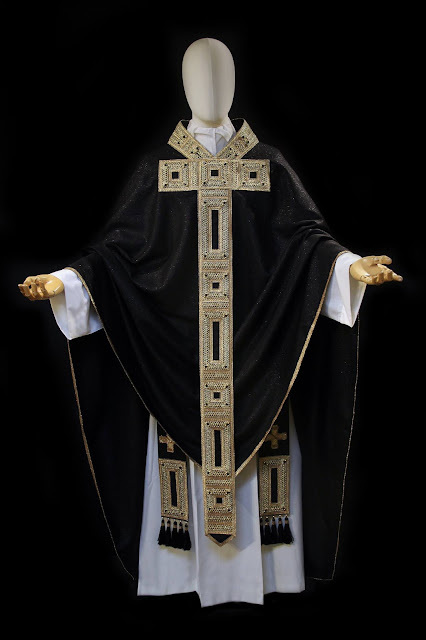 It is also good to see that black is being produced by contemporary vestment makers -- and this isn't the only black vestments on the LAVS site I'd note. Two more I thought worth sharing. That on the left is similar in feel to that just above, while the chasuble on the right begins to take on a more renaissance like feel while still retaining the fuller gothic shape. 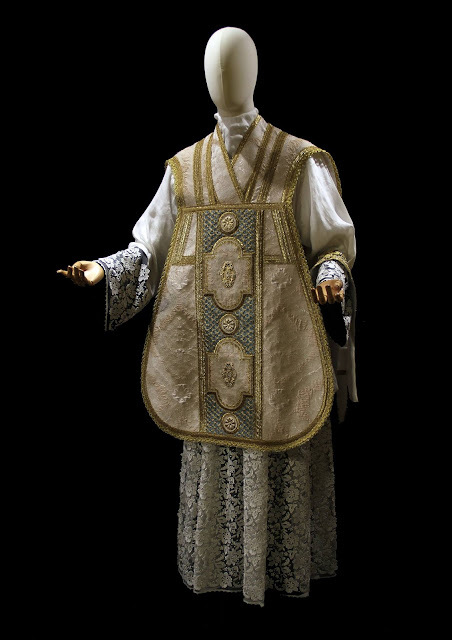 Finally, I'd like to conclude with a few details coming from some copes and chasubles. These show in better detail the detailed ornamental work that Atelier LAVS does. 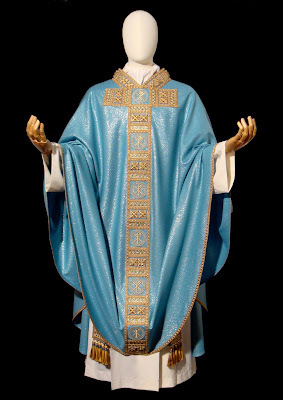 Finally, as a concluding bonus, I know a number of you are very interested in the liturgical privilege of blue that certain countries have for Marian feasts, so here is one of their blue offerings.